My research program involves several areas of ornamental plant breeding and cultivar development. Of primary interest is the development of sterile forms of nonnative species that are of economic importance to Oregon growers to prevent escape from cultivation. Primary techniques to achieve sterility/reduced fertility include develoment of triploids using ploidy manipulation, as well as mutagenesis by exposing seeds or meristems to physical and chemical mutagens. We are also trying to develop new cultivars that have increased insect and disease resistance. We conduct fundamental research in traditional genetics, cytogenetics, molecular genetics, and genomics to support the applied breeding program with the goal of developing plants that are attractive to consumers, easy for growers to produce, and resilient in modern landscapes. B.S. Horticultural Science, North Carolina State University - Raleigh, North Carolina - December 2002. Associate Professor, Oregon State University, Department of Horticulture. 40% Teaching / 35% Research. September 2016 - current. 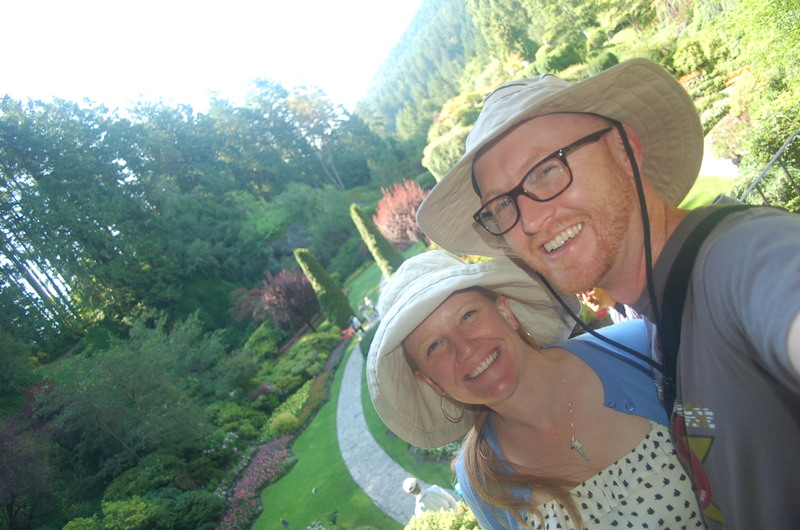 Tyler is a native Oregonian who has degrees from Clackamas Community College, George Fox, and Virginia Tech. The latter is where he honed his expertise in managing water and nutrients in soilless substrates of nursery crops - earning his M.S. with former Oregon State professor, Jim Owen. 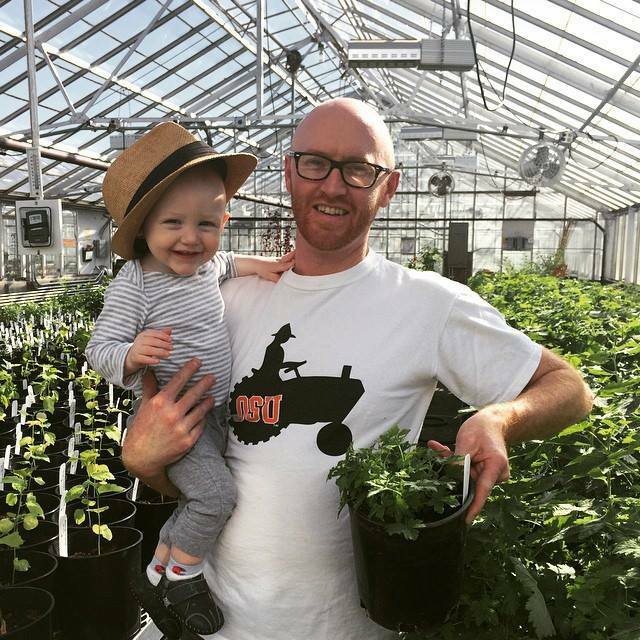 Tyler expertly manages the growing operation for the breeding program from propagation, to containers, field production, irrigation, and fertilization. 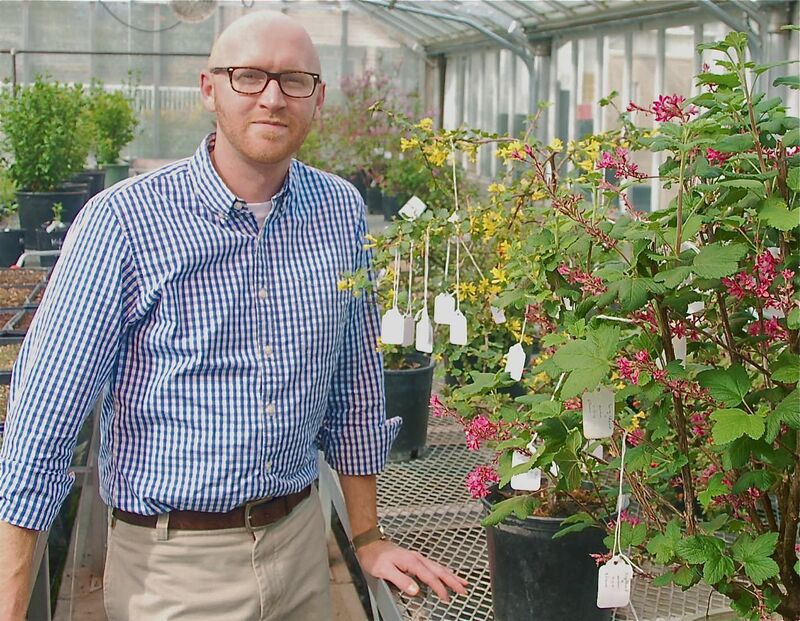 Jason Lattier - Ph.D. 2017 - Breeding and Genetics of Lilacs and Hardy Hibiscus. Current Position: Post Doctoral Researcher at the US National Arboretum. Beltsville, MD. Justin Schulze - M.S. 2017 - Breeding, Production, and Morphophysiology among Cytotypes of Common and Portuguese Cherrylaurel. Current Position: Breeder and Horticulturist with Bailey Nurseries, Inc. at their PII location in Watkinsville, GA.
Kim Shearer - M.S. 2016 - Inducing and evaluating phenotypic and cytometric variation in landscape plants: Observations from Acer, Galtonia, and Penstemon. Current Position: Tree and Shrub Breeder at the Morton Arboretum, Chicago, IL. Lena Wilhelm. Assessing ploidy variation of Berberis nervosa over its geographic distribution: preliminary observations from the collections of the OSU Herbarium. Ty Seely. Analysis of pollen from 22x, 33x, 44x, and 22x+44x common cherrylaurels. Patrice Woodworth. Ploidy analysis of seedlings dervied from 2x+4x Hydrangea macrophylla. Gwyn Alanko: Ploidy analysis of maple seedlings derived from tetraploid parents. Jon Dempster: Fertility and morphological observations of 2x, 3x, and 4x crabapples including 'Prairiefire' and its polyploid derivatives. *Lattier, J.D., H. Chen, and R.N. Contreras. 2019. Variation in genome size, ploidy, stomata, and rDNA signals in althea (Hibiscus syriacus L.). J. Amer. Soc. Hort. Sci. 144(2):130-140. Hoskins, T. and R.N. Contreras. 201X. Increasing rates of ethylmethane sulfonate reduced seed germination percent, occurrence of twin seedlings, and plant height of Sarcococca confusa. HortScience (Submitted). Graebner, R.C., H. Chen, R.N. Contreras, K.G. Haynes, and V.R. Sathuvalli. 2019. Identication of a high frequency of triploid potatoes from tetraploid x diploid crosses. HortScience (Accepted). Vining, K.J., I. Pandelova, K. Hummer, N. Bassil, R.N. Contreras, K. Neill, H. Chen, A.N. Parrish, and B.M. Lange. Genetic diversity survey of Mentha aquatica L. and Mentha suaveolens Ehrh., mint crop ancestors. Genetic Resources and Crop Evolution 66(4):825-845. *Chen, H., L. Xue, T. Li, and R.N. Contreras. 2019. Quantile regression facilitates simultaneous selection of negatively correlated floral traits among BC1F1 progeny of the male fertile hybrid cultivars Lohengrin and Resi (Hibiscus syriacus x H. paramutabilis). J. Amer. Soc. Hort. Sci. 144(1):70-76. *Lattier, J.D. and R.N. Contreras. 2017. Intraspecific, interspecific, and interseries cross-compatibility in lilac. J. Amer. Soc. Hort. Sci. 142(4):279-288. (JASHS cover). *Lattier, J.D., H. Chen, and R.N. Contreras. 2017. Improved method for enzyme digestion of root tips for cytology. HortScience 52(7):1029-1032. *Schulze, J.A., J.D. Lattier, and R.N. Contreras. 2017. In vitro germination of immature Prunus lusitanica seed. HortScience 52(8):1122-1124. *Schulze, J.A. and R.N. Contreras. 2017. In vivo chromosome doubling of Prunus lusitanica and preliminary morphological observations. HortScience. 52(3):332-337. *Schulze, J.A., R.N. Contreras, and C.F. Scagel. 2017. Comparing vegetative propagation of two ‘Schipkaensis’ cherrylaurel ploidy levels. HortTechnology 27(1):69-72. Contreras, R.N. and L. Meneghelli. 2016. In vitro chromosome doubling of Prunus laurocerasus 'Otto Luyken' and 'Schipkaensis'. HortScience 51(12):1463-1466. *Rothleutner, J.J., M.W. Friddle, and R.N. Contreras. 2016. Ploidy levels, relative genome sizes, and base pair composition in Cotoneaster. J. Amer. Soc. Hort. Sci. 141(5):457-466. Contreras, R.N. and M.W. Friddle. 2015. ‘Oregon Snowflake’ flowering currant. HortScience 50(2):320-321. *Rothleutner, J.J., R.N. Contreras, V.O. Stockwell, and J.S. Owen, Jr. 2014. 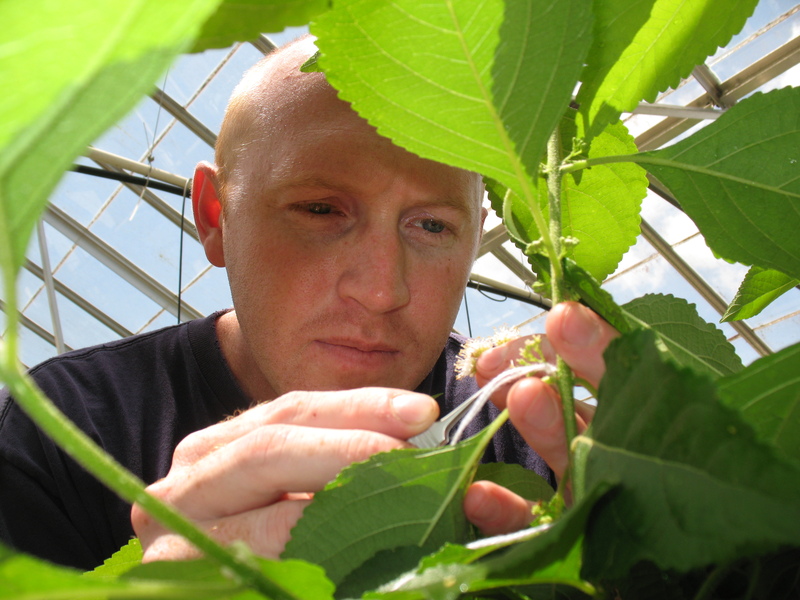 Screening Cotoneaster for resistance to fire blight by artificial inoculation. HortScience 49(12):1480-1485. Contreras, R.N., J.M. Ruter, J.S. Owen, Jr., A. Heogh. 2013. Chlorophyll, carotenoid, and visual color rating of japanese-cedar grown in the southeastern United States. HortScience 48(12):1452-1456. Schwartz, B.M., R.N. Contreras, K.R. Harris-Schultz, D.L. Heckart, J.B. Peake, and P.L. Raymer. 2013. Discovery and characterization of a turf-type triploid seashore paspalum. HortScience 48(12):1424-1427. Schwartz, B.M., K.R. Harris-Schultz, R.N. Contreras, C.S. Hans, W.W. Hanna, and S.R. Milla-Lewis. 2013. Creation of artificial triploid and tetraploid centipedegrass using colchicine and breeding. Intl. Turfgrass Soc. Res. J. 12:327-334. Contreras, R.N., J.S. Owen, W.W. Hanna, and B.M. Schwartz. 2013. Evaluation of seven complex Pennisetum spp. hybrids for container and landscape performance in the Pacific Northwest. HortTechnology 23(4):525-528. Schwartz, B.M., K.R. Harris-Schultz, C.S. Hans, R.N. Contreras, and S.A. Jackson. 2013. Creation of hexaploid and octoploid zoysiagrass using colchicine and breeding. Crop Science 53:2218-2224. Contreras, R.N., R. Golembiewski, J. Velez. 2013. Evaluation of study habits of plant identification students. HortTechnology 23(1):130-133. Vining, K.J., R.N. Contreras, M. Ranik, and S.H. Strauss. 2012. Genetic methods for mitigating invasiveness of woody ornamental plants: research needs and opportunities. HortScience 47(9):1210-1216. Contreras, R.N. 2012. A simple chromosome doubling technique is effective in several species of Cupressaceae. HortScience 47(6):712-714. Contreras, R.N., R. Determann, and M. Friddle. 2011. Differences in winter browning among japanese-cedar cultivars are not due to variation in ploidy levels. HortScience 46(11):1465-1467. Contreras, R.N. and J.M. Ruter. 2011. Genome size estimates and chromosome numbers of Callicarpa L. (Lamiaceae). HortScience 46(4):567-570. Contreras, R.N., J.M. Ruter, and B.M. Schwartz. 2010. Oryzalin-induced tetraploidy in Cryptomeria japonica (Cupressaceae). HortScience 45(2):316-319. Contreras, R.N., J.M. Ruter, and W.W. Hanna. 2009. An oryzalin-induced autoallooctoploid of Hibiscus acetosella Welw. ex Hiern. ‘Panama Red’ (Malvaceae). J. Amer. Soc. Hort. Sci. 134(5):553-559. Contreras, R.N. and J.M. Ruter. 2009. Sulfuric acid scarification of Callicarpa americana (Lamiaceae) seeds improves germination. Native Plants J. 10(3):283-286. Contreras, R.N. and T.G. Ranney. 2008. New opportunities for breeding fragrant rhododendrons. J. Amer. Rhododendron Soc. 62(4):201-202. Contreras, R.N., T.G. Ranney, and S.P. Tallury. Reproductive behavior of diploid and allotetraploid Rhododendron L. ‘Fragrant Affinity’. 2007. HortScience 42(1):31-34. J. A. Schulze, Lattier, J. D., and Contreras, R., “In vitro germination of immature Prunus lusitanica seed”, HortScience, vol. 52, no. 8, 2017. 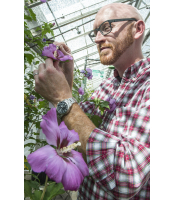 J. D. Lattier and Contreras, R., “Ploidy and Genome Size in Lilac Species, Cultivars, and Interploid Hybrids”, Journal of the American Society for Horticultural Science, vol. 142, no. 5, pp. 355 - 366, 2017. J. A. Schulze, Contreras, R., and Scagel, C. F., “Comparing Vegetative Propagation of Two ‘Schipkaensis’ Common Cherrylaurel Ploidy Levels”, HortTechnology, vol. 27, no. 1, pp. 69 - 72, 2017. J. A. Schulze and Contreras, R., “In Vivo Chromosome Doubling of Prunus lusitanica and Preliminary Morphological Observations”, HortScience, vol. 52, no. 3, pp. 332 - 337, 2017. J. D. Lattier and Contreras, R., “Intraspecific, Interspecific, and Interseries Cross-compatibility in Lilac”, Journal of the American Society for Horticultural Science, vol. 142, no. 4, pp. 279 - 288, 2017. J. D. Lattier, Chen, H., and Contreras, R., “Improved Method of Enzyme Digestion for Root Tip Cytology”, HortScience, vol. 52, no. 7, pp. 1029 - 1032, 2017. R. Contreras and Meneghelli, L., “In Vitro Chromosome Doubling of Prunus laurocerasus ‘Otto Luyken’ and ‘Schipkaensis’”, HortScience, vol. 51, no. 12, pp. 1463 - 1466, 2016. J. J. Rothleutner, Friddle, M. W., and Contreras, R., “Ploidy Levels, Relative Genome Sizes, and Base Pair Composition in Cotoneaster”, Journal of the American Society for Horticultural Science, vol. 141, no. 5, pp. 457 - 466, 2016.